Core concept tutorials with on-screen visualization and expert narration via our signature Rapid Learning System. Feedback-based problems with a scoring system to track performance and complete solution to review concepts. One cheat sheet per chapter and all key concepts in an at-a-glance single sheet, both printable and laminable, ideal for exam prep and quick review. One eBook per chapter, an easy-to-read print version of the tutorial video. One AudioBook per chapter for learning-on-the-go on any MP3 player or smart phone. Course Desciption: This visual series is designed for anyone whose major is either physical science, life science or engineering. Not self-learned, you will be taught each and every physical chemistry topic, visually and rapidly. This course is constructed to meet most mainstream textbooks and university curricula with focus on core concepts and problem solving. 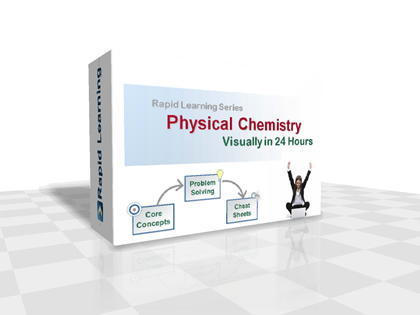 To get you prepared, the tutorial series starts out with the easy review of chemistry, physics and math required for physical chemistry. The first part of this course will cover the laws of thermodynamics, equilibirum, phases, electrochemistry, biochemical thermodynamics, quantum mechanics, electronic structure, symmetry, group theory and statistical mechanics. The second part of the course will study molecular spectroscopy, kinetics and dynamics, solid state chemistry and the guide to the lab. This rich-media course is specifically designed for immersion study with intensity, one hour per chapter with the total of 24 chapters. Master this hard subject with expert narration in an easy-to-follow system. Instead of reading the static texts yourself slowly, let our professors teach you visually and rapidly. Study Guide: For a free chapter-by-chapter content study guide, download and print our Physical Chemistry Course Guidebook (56-page eBook in downloadable PDF). For Whom: Students who are either currently taking physical chemistry or to learn this subject at self-paced. This is speficially for students who are having difficulty with the class now and need a premium supplement for quick turn-around via rich-media learning. This series provide simple yet easy-to-understand tutorials in flash movies for core concepts in physical chemistry – the ones that are fundamental yet difficult to master.